Refresh Your Skills - Bluewater Scuba - "Where Nashville Learns To Dive"
If you haven't dived in the last 6 months, many resorts now require a full scuba tune-up before your next dive trip. Recapture the feeling of total confidence by updating the diving skills you learned in your Open Water Diver course. Knowledge: If you would also like to review your academic skills, go to www.padi.com or click on the photo above to register for the online, eLearning Tune-Up module. The PADI eLearning academic reviews are not included in the cost of your Bluewater Scuba Pool refreshers. Skills: In the Scuba Tune-Up course you will have the opportunity to review the pool skills you learned during your Open Water Diver course. Your instructor will also teach you any new skills or skills that might have changed since your course. You will have the opportunity to practice in the comfort of our indoor heated pool under the guidance of a professional instructor. Equipment: Your Scuba Tune-Up is a great opportunity to re-learn your dive equipment. Taking the time to practice with your equipment in a comfortable and clean pool environment will improve not only your performance as a diver but your safety as well. Your instructor will also be able to answer any questions that you have regarding equipment changes, upgrades, or purchases. If the group refresher schedule does not work for you, we can easily schedule a private refresher around your schedule with a little advanced notice. Includes all scuba equipment, but you will need to bring your own snorkeling gear (mask, snorkel, fins) and wetsuit. 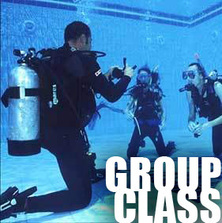 If you have your own scuba equipment(BCD and regulator), we will credit you $30 on the day of your lesson. Download and complete the Continuing Education Form. If there are any "YES" answers on the medical questionnaire, you will need a doctor to sign this medical statement prior to your pool session (required).